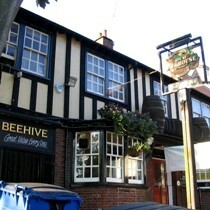 The Beehive in St Albans is a large pub just off the London Road opposite Marlborough Rd. Popular with students but pub regulars are all ages and mixed. This pub is good for large groups as there is plenty of seating available. Three plasma screens are available for watching the football. At the time of the visit they were tuned to Sky Sports News (no volume). Service was pleasant and quick although we did visit early on in the evening when it was quieter. Large patio at back with table tennis table so great in the summer evenings. Apparently it does evening food although we saw no evidence of it. Wi-Fi access is provided by The Cloud. Overall a reasonable traditional pub with a mix of ages, both male and female. The beer selection could be improved. The Beehive has just been refurbished and is under new management. Now serving Deuchars IPA. Further review to follow soon.